KHAZAR, Iraq, Jun 15 2014 (IPS) - “People with long beards and dressed like Afghans broke into our neighbourhood after they had bombed it. We were lucky to escape from that nightmare,” Aum Ahmad, a46-year-old woman from Mosul – 400 km northwest of Baghdad – told IPS from the recently set up Khazar refugee camp, 25 km east of the besieged city. “The fighters spoke classic Arabic to each other so it was obvious to everyone that they were from outside Iraq,” she added, while striving to organise her belongings inside the blue tent she and her family will have to share with fellow refugees. They are just a few among the 500,000 that, according to the U.N. 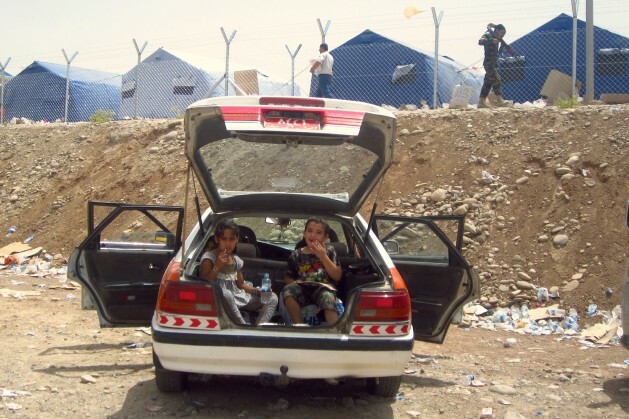 Refugee Agency (UNHCR), have left Mosul in recent days after the city was taken over by Sunni insurgents on June 10. An estimated 300,000 of them [refugees from Mosul] are reportedly seeking shelter in the Iraqi Kurdistan Region, the closest thing to a state of their own the Kurds have ever had, and which has remained almost untouched by the on-going violence in the rest of the country. However, only those with family members or sponsors who can provide accommodation are allowed to enter Erbil, the administrative capital of Iraqi Kurdistan, 390 km north of Baghdad. Samia Hamoud,a 48-year-old mother of eight children, was not lucky enough to be among the latter. She says she will stay in the camp because she is worried about her children´s safety. “My street was full of bodies but nobody could retrieve them back because of the snipers,” recalls Hamoud, who said that she lost her husband in the shelling of Nabi Yunus district, on the eastern bank of the Tigris river which bisects the city. Many sources are giving full credit for the fall of Mosul to the Islamic State of Iraq and Syria (ISIS), a Jihadi group formerly linked to Al Qaeda that is today claiming territory in both countries. “They were well organised. On our way out, they were manning checkpoints and checking people´s passports and IDs through laptops with an internet access. I guess they were looking for men who had any relation with the Iraqi security forces,” she added. Hamoud´s testimony does not bear out the theory that gives full credit to ISIS for the victory in Mosul. “The Iraqi Sunnis were the first victims of Al Qaeda-linked groups just after the invasion in 2003,” underlined the senior official, who hopes for a decentralised Iraq. Alongside other cities in Western Iraq, Mosul also hosted massive demonstrations from December 2012 until March 2013. Iraq´s Sunni population is variously estimated to be between 20 and 40 percent of Iraq’s population of 32 million. They have been complaining of increasing marginalisation by the predominantly Shia political leaders. Ghanim Alabed was one of the most visible faces of the protests in Mosul. The 40-year-old accountant had moved to Erbil in April after the demonstrations dragged the west of the country into unprecedented chaos since the peak of sectarian violence between 2006 and 2008. “The fall of Mosul is the victory of the revolution,” Alabed told IPS Saturday from his residence in Erbil. “It has been thanks to a joint operation by Islamic groups such as Ansar al-Sunna, the Mujahideen Army, but also the Army of the Men of the Naqshbandi Order (JRTN), a group set up in 2006 after the execution of Saddam Hussein, and allegedly commanded by Izzat Ibrahim al Duri, a top military commander and a vice president in the Hussein government. In fact, Mosul was the country´s last stronghold for the Baath party of Iraq´s ousted ruler Saddam Hussein. Many analysts still wonder how a city of two million could fall just in a few hours. Local Sunni insurgent groups had never shown such power since the country´s invasion. On the other hand, ISIS fighters have struggled in vain to take over much smaller Kurdish villages in northeast Syria for over two years. “We were betrayed by our own captains and commanders. When we realised they had all left, we changed our uniforms for plains clothes and followed suit,” the 35-year-old told IPS while he queued in Erbil for a flight ticket to Baghdad. Salem had served in Mosul for over three years and, as most of the soldiers deployed in Iraq´s predominantly Sunni west, he is also Shiite. He said he could not figure out whether the attackers were ISIS fighters or local Sunni militants.